Direct Lease Driver of the Month, Errol Henry, Moreno Valley, Calif., has more than 36 years of experience as a professional household goods mover. Errol has a great driver rating and this is his third Driver of the Month award with the van line. Grover Wood, Olympic Moving & Storage III, Lakewood, Wash., earned Wheaton’s Permanent Fleet Driver of the Month award. 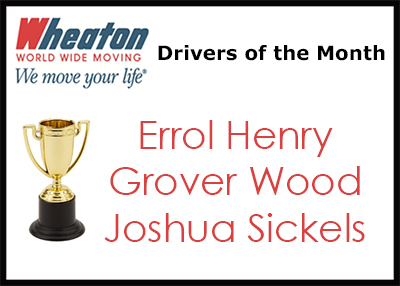 Grover has more than eight years of experience as a professional mover and this is his third Driver of the Month award. Grover was also selected as Driver of the Year in 2015. Joshua Sickels, Capital City Transfer, Inc., Madison, Wis., earned Wheaton’s Intermittent Fleet Driver of the Month award. Josh maintains an excellent performance rating and has 22 years of experience as a professional mover. This is his second Driver of the Month award with our company.